Carte des Isles de la Societe decouvertes parle Lieut. J. Cook. 1769. 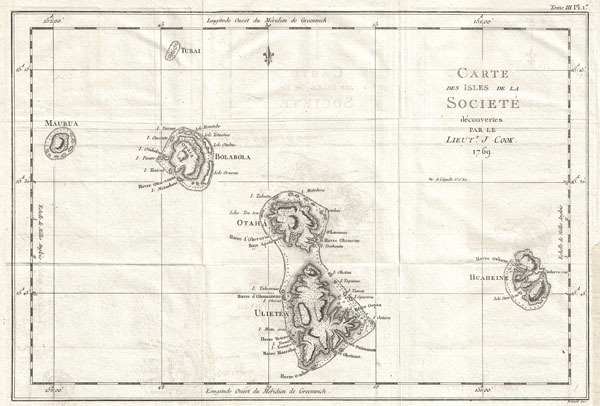 This is a fine example of the first published map of the Society Islands, composed by James Cook on his first voyage. Consists of the islands of Maurua, Tubai, Bolabola, Otaha, Ulietéa and Huaheine. This group was identified by Cook in 1769, when he wrote in his journal, 'So call'd by the Natives and it was not thought advisable to give them any other names but these three together with Huaheine, Tubai, and Maurua as they lay contiguous to one another I have named Society Isles .' Offers considerable detail on each of the island, attempting to show reefs, mountains, valley, topographical features and, occasionally, depth soundings. Engraved by Bernard for the 1774 French edition of John Hawkesworth's Account of the Voyages…, in which this was contained as Plate 1 in Volume III. John Hawkesworth (c. 1715 - November 16, 1773) was an English born writer and editor born London. Hawkesworth, who is said to have been self educated, succeeded Samuel Johnson as the parliamentary debate compiler for "Gentleman's Magazine". He was a deeply religious and moral map who brilliant defense of morality earned him an LL. D degree from the Archbishop of Canterbury. Hawkesworth went on to publish a series of scholarly books and essays including a 12 volume edition of Jonathan Swift's work. In 1772 Hawkesworth was commissioned by the Admiralty to compile and edit James Cook's journals. The resultant work An Account of the Voyages undertaken ... for making discoveries in the Southern Hemisphere was one of the first ethnographic account of the South Seas and was widely published in England and abroad. Though highly influential, Hawkesworth's work received heavy criticism from scholars who claim that he liberally altered much of the text in the name of morality. Very good conditon. Original folds. Light transference.